BEVERLY HILLS, CA - An extraordinarily rare English language copy of Russia's Treasure of Diamonds and Precious Stones, edited by Aleksander Evgenevich Fersman and published to 1925, will highlight the offerings in Heritage Auction Galleries Beverly Hills' Oct. 14, 2010 Signature« Rare Books Auction. Only a handful of these books have surfaced at auction in the last 80 years. "It's an understatement to say that this is a rare volume," said James Gannon, Director of Rare Books at Heritage. "In fact, it's downright astounding that any of these books survived, especially in English, given where and when it was produced, in the early part of the Russian Communist regime, by a government that made a specific practice of vilifying its czarist history. There are a lot of collectors out there that will be keeping a very close eye on this amazing book." The monumental task of listing and photographing the Russian crown jewels, the symbols of the recently deposed Russian royal family, began in 1922, with this epic work being the result. Compiled with the help of S. N. Troinitsky, then-director of the Hermitage Museum, and a committee of expert jewelers, Russia's Treasure of Diamonds and Precious Stones was published in 1925 in English, French and Russian, and stands as the only complete record of the treasures of the Romanov Dynasty before their mysterious dispersal through private sale and a subsequent auction in 1927. "The book is nothing short of awe-inspiring," said Gannon. "The 100 unbound phototype plates in the book, all with descriptive text, show the scope and the vision of the jewelers that created these monumental treasures. " True to form, Stalin's repressive government quickly made an about face on its decision to produce the book, and even it's the very existence of the volume - perhaps the fact that it contained proof of the feudal age before the Revolution was too cognitively dissonant for the tyrannical Politburo - and swiftly recalled all copies of the book. The Soviet government quickly destroyed the copies it received or bought back. As such, it is an exceedingly rare work in any of the three languages, and much desired by gemologists, jewelers, and historians. "The collection of Romanoff Crown Jewels dates back to the Sixteenth Century, when the early Czars, proud of their power, were fascinated by the splendor of parading about in jeweled robes wearing diamond-studded crowns," wrote Armand Hammer in The Quest of the Romanoff Treasure. "However, it was not until the reign of Catherine the Great that the Russian collection of jewels reached its greatest proportion. Catherine sent her agents abroad to purchase the largest and finest diamonds and emeralds in the world... Soon after the beginning of the War in 1914, the Imperial Cabinet decided it was safer to remove the Crown Jewels to Moscow, which is much farther inland than St. Petersburg. Nine huge strong boxes, crammed full of these priceless gems, were stored in a special vault in the 'Armory Hall of the Kremlin.'" The jewels were safe-guarded during the Bolshevik Revolution, and until 1922, were kept under guard by a detachment of Red soldiers. 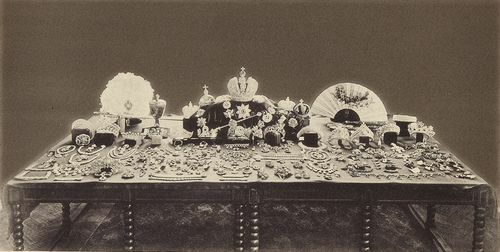 The Soviet government turned its attentions to the decadent treasures in April 1922 and an inventory was subsequently commissioned. A committee of prominent citizens, including A. Fabergé, son of the former world famous court jeweler Carl Fabergé, soon produced the survey, which gave Russia's new ruling class an idea of the fabulous wealth of the recently deposed aristocracy, including 25,300 carats worth of diamonds, 6,000 pearls, 3,200 emeralds, 2,600 sapphires and 1,500 carats worth of rubies, which is but a small portion of the extraordinary collection.